ALERT! ALERT! New opening titles and theme tune are flying in past your window! Please for your comfort do not adjust your seating position or remove your headphones. 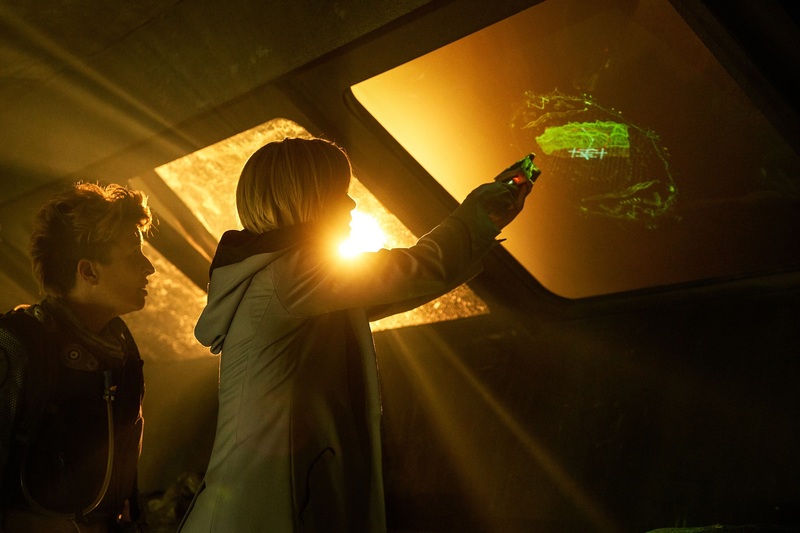 We waited and episode 2 into series 11 we finally saw and heard what was missing last week as Doctor Who burst out its theme this week. 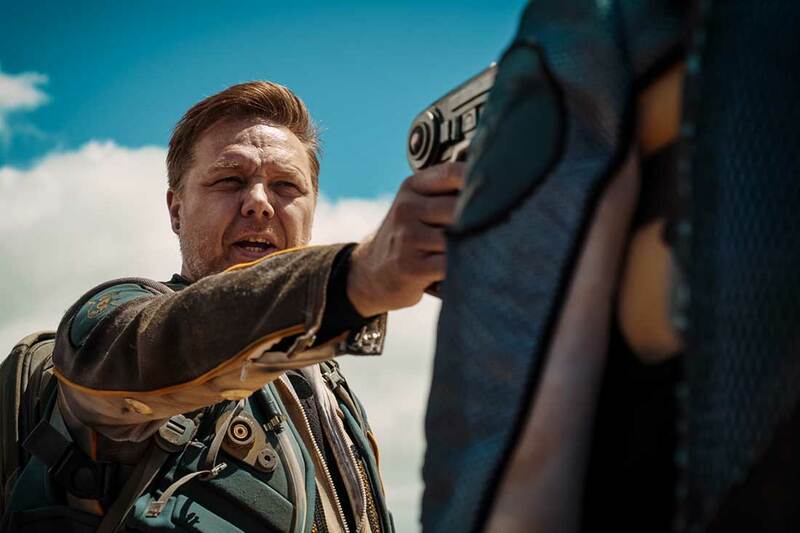 An interesting bold move as Chris Chibnall and the team are laying out a trail of goodies for us as we progress down the Series 11 path. Not using opening titles in the first episode allowed us to concentrate on all the other firsts in the story, first female doctor, new companions, fresh location without the distraction of a new bulky theme. To have had it all last week would have been “newness” overload. It’s been many years probably going back to series 4 since I actually loved any Nu-Who opening theme or titles and the theme definitely acknowledges its classic roots, which pleases this fan very much. Even with the drum beat, you can hear parts of the original Ron Grainer theme at the heart. The opening titles were done by a regular Youtuber John Smith (not his real name of course!) who did the Sherlock Doctor Who crossover video and worked on a series 10 episode and the Christmas special. I loved the wave action and noise at the beginning before the visuals moved into a swirling colourful kaleidoscope and the starry universe. The universe graphics felt reminiscent of the real-life photographs you see on “Sky at Night” and it’s a world away from the Matt Smith flying Tardis titles which bored the life out of me. The kaleidoscope does make me feel nauseous if I stare too hard but I had the same feeling watching Avatar in 3D. The titles were perfunctory highlighting each member of the team adding to the group dynamic this year but I liked the whoosh sound we got before the episode title and writer and off we went with no fade in straight into the episode. Mark Tonderai, the director, deserves Epzo’s cigar for what he then gave us which was a feast for the eyes. I adored the opening shot reflected from Ryan’s eye as they got scooped up by Angstrom’s spaceship and Ryan’s blurry point of view as he woke. South Africa was worth visiting as the landscape of the desert was beautiful. There are certain episodes that when you say their name your brain is flooded with images and you smile. “City of Death” has you those scenes of Tom and Lalla wandering in Paris, “The invasion” swinging London iconic St Pauls Cathedral, and “Vincent and the Doctor” that sun-filled garden bursting with sunflowers. The first 9 minutes of “The Ghost Monument” had me very excited by what I saw. Mark Tonderai cleverly played with different types of shots, overhead, close up, point of view, moving action shots to keep the story interesting especially the urgency of the crash landing. There were so many really interesting usual shots, the jettison of the back engine, the desert, watching the suns set in the science building, the attack of the robots. The guy really understands composition. There was a lovely time-lapse shot of moons disappearing as the suns rose later which was absolutely stunning. I also loved the ghostly desert music from our resident composer Segun which added an ethereal atmospheric feel to the visuals. Two episodes in and Jodie is playing her version of the Doctor which I’m struggling slightly with. I know this is Doctor Who, it looks fantastic which thrills me, but I’m still waiting to see her click in completely as ‘the Doctor’ for me. I apologise in advance for my southern ears but I am still distracted by the Doctor’s accent at times which seems to pitch up and down in tone. It does feel slightly acted and laid on a bit heavy. Christopher Eccleston did have a Northern accent but somehow his didn’t feel that noticeable. Different region I guess. Character-wise at times, she does come across as a bit school maamish, chiding her companions, mocking Ilin as a hologram but that isn’t necessarily a criticism as she is in survival mode knowing she has to stay focused in a hostile environment and keep her companions alive. She doesn’t suffer fools but also doubts herself and I quite like that contrast. There are tinges of Peter Davison when she doesn’t always know the answers and questions things out loud. Where the plot suffered a little Chris Chibnall excels with characters and all the guest actors mastered what they are given within the time constraints of the script. There were persuasive performances from Susan Lynch and Shaun Dooley. Angstrom and Epzo are by turn sympathetic and cocky pushed to win. Epzo is brash wants the glory and money. Angstrom is doing it for her family. The little vignettes of backstory added in the script add pathos to their reasons. Art Malik as Ilin was the rather single-minded master of this circus ring but not really a villain. He had that single-minded selfish streak of the explorer mastering the race originally with only being interested in controlling the challenge. I just wish he had had a larger part as he fascinated me. There was such a small guest I didn’t get a sense of scale, of 4000 competitors who had taken part in this race just because Art Malik said so. I enjoyed Graham and Ryan again this week. Ryan is such a typical teenager not wanting to talk, lacking confidence at times and Graham is trying so hard to protect and look after him. I’m surprised he didn’t intervene when Ryan wanted the call of duty run against the robots. It worries me that I’m enjoying their characters too much, that they will slowly bond but that Graham won’t make it to the end of the series. Their relationship is such an interesting one. Bradley Walsh excels at the grumpy old man and I loved the visual gag of him wearing women’s sunglasses which made me chuckle What a tinker! Graham is definitely my favourite and Bradley’s experience as an actor does shine through. Yas doesn’t get much to do again this week and still doesn’t inspire me to really like her. It does feel a bit Torchwood in that respect that she is the Ianto of the group there in the background, a spare part. She seems overwhelmed by the situation they are in whereas her police woman training should kick in enabling her to direct them through the desert? As accidental and reluctant travellers what I did enjoy is how they all questioned trusting the doctor and it isn’t an automatic assumption. I’ve read comments that Chris Chibnall has ‘dazzled with mediocrity’ which is a little harsh. Despite imagining how the script could have been a bit more effective. I enjoyed “The Ghost Monument” It’s a bit of a caper full of interesting little moments. We also have been given a hint of something else perhaps? The timeless child. I did initially wonder if this hinted at another Timelord (related to the Doctor) but perhaps it was just a description of the Doctor without her Tardis. I didn’t guess the “Ghost Monument” was the Tardis so the Doctor’s reaction to seeing her beloved Tardis again was a lovely emotional moment. Seeing the inside of the Tardis was very different. The fronds or pillars look quite organic, alien and dark. It wasn’t WOW more what the heavens have they done? I may grow to like it but I prefer something a bit higher tech looking. 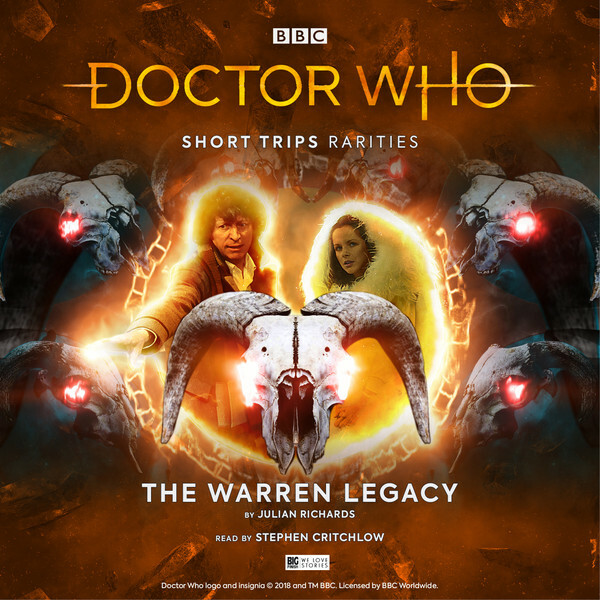 The Short Trips range is one of the strongest sets from Big Finish at the moment. Sometimes though, we get even more treats, listeners really do get more from Big Finish! 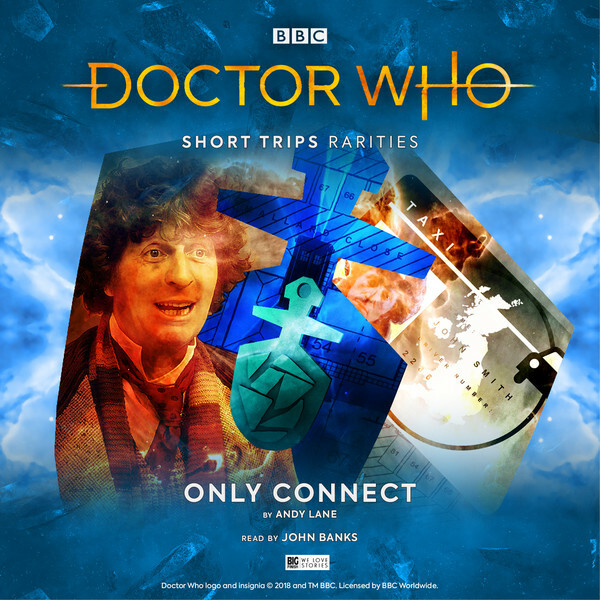 The Short Trips Rarities Range feature stories that have previously been released as either free-gifts with Doctor Who Magazine or subscriber-only downloads. We’ve had ten so far and last month we were treated to a further five. Featuring a range of Doctors, companions, stories, authors and readers, these thirty-minute stories are a real delight for the ears. One of the first things that will be apparent to the listener is what a great handle Wing has on the main characters. This story could easily fit between the television stories, The Savages and The War Machines but listening to the relationship between the Doctor and Dodo, one might even include the Missing Adventures novel, The Man in the Velvet Mask, given that their relationship seems to be a little fraught here at times. But you could easily hear William Hartnell and Jackie Lane performing this play. The story from Wing is a fairly basic runaround but that isn’t a bad thing, with complex stories coming out from Big Finish all the time, sometimes it is nice to go back to Doctor Who basics, a little runaround, solve a mystery and then go back to the TARDIS before people even know your there. In that respect, this story is one of the most enjoyable of the five. Stephen Critchlow does a good job narrating this tale. His impersonation of Hartnell is excellent, effortlessly getting the characterisation he had towards the end of his tenure. Over the course of the Hartnell era we saw him go from a scary old man who wanted to leave Ian and Barbara at the mercy of cavemen and Daleks to a happy, loving man who would do anything for his friends to someone who had become distant and detached from his companions by the time The Tenth Planet comes around. There is a moment here were he contemplates leaving Dodo behind. Luckily he doesn’t and the pair goes off to have more adventures but this is certainly the detached Doctor from the latter half of his era. Critchlow does a good job of recreating that attitude. 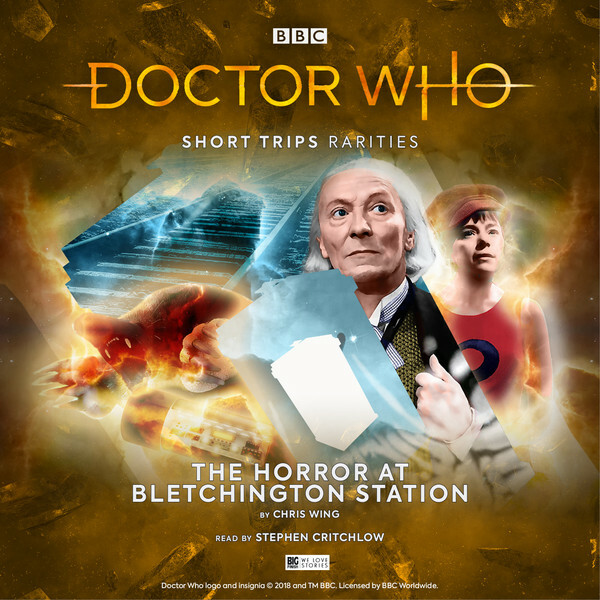 But that is a minor quibble as The Horror At Bletchington Station is a decent release overall, well worth the £2.25 price tag. It is enjoyable half-hour with some strong writing, a good performance and some nice direction from Neil Gardener to keep things in check. 2015 saw the Doctor discovering a hidden trap street. It was here that Masie Williams betrayed him, sending him off to the Time Lords and where Clara met her ‘sort-of’ death when she faced the raven. But in terms of continuity, the Third Doctor got there first, discovering a hidden village in the depths of the Scottish Highlands. With the sad passing of Caroline John we don’t get many Liz Shaw audios any more, it is a shame that she didn’t get to meet Tim Trelor’s version of Three as we would have gotten some fantastic sets. But the beauty of these Short Trips format is that we can get stories about companions or Doctors whose actors have sadly passed on. 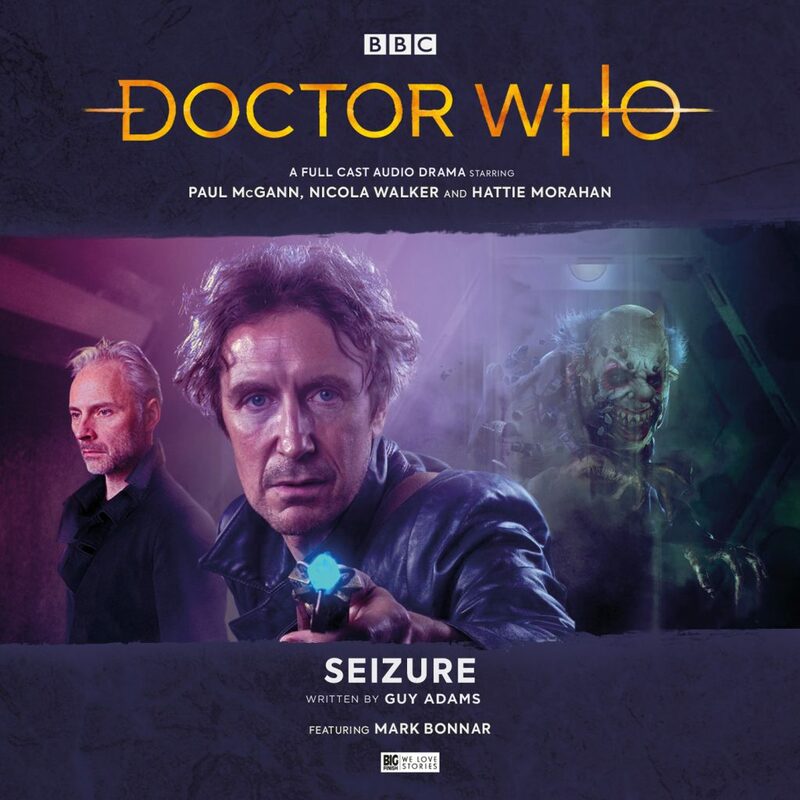 Nick Wallace has written a beautiful story here and it is annoying that it has taken Big Finish so long to release this story as an available release for people who don’t subscribe. Nick Wallace does a great job here, capturing the characters of the Third Doctor and Liz perfectly and the story would easily fit in between Inferno and Terror of the Autons. It is a story about refuge and refugees, survivors and hunters and has some impressive real-world mirroring. Making it as relevant today as it would have been when it was first released. Stephen Critchlow is once again on narration duty and he seems a lot more on form in the world of the Third Doctor than the First. He once again captures the spirit of Pertwee’s performance, so much so that there are times when you wonder if Pertwee himself is doing it. He also makes the wise decision of not really trying to impersonate Liz Shaw but just giving her the same attitude she had on screen. In many ways, his narration is far superior to that of the previous release. 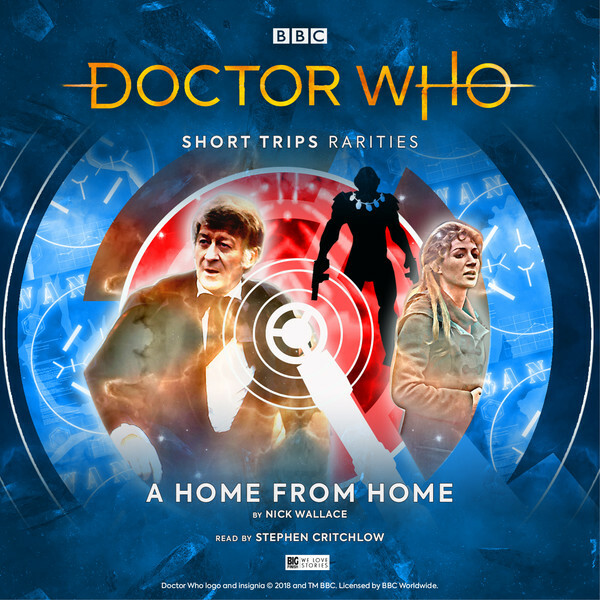 Overall A Home from Home is another great release for the Short Trips Rarities with Wallace giving us some strong Third Doctor storytelling. He does a brilliant job of capturing the characters of Three and Liz Shaw as well as some menace from the villain. Critchlow seems to have a blast on narration duties and once again there is some strong direction from Neil Gardener. Only Connect is perhaps one of the strangest Doctor Who premises I’ve ever heard. James Willaker has been working hard, he’s tired and its been a long day and wants a taxi home. Chatting to your driver is something common for everyone. But those conversations can’t change the future. But maybe they can, when the Doctor is involved. Andy Lane delivers a really strange yet interesting story. The Doctor is working as a taxi driver, something that seems very suitable for the Fourth Doctor a man who could make friends with anyone. Lane does an excellent job of connecting this story with The Seeds of Doom, a classic Baker story. But the story is about more than a connection to one of the greatest stories of all time, it is a story about how one person’s life can be turned upside-down by meeting the Doctor. But it also shows the crueller side of the Doctor, one side that will use people to get the information he wants. And that is a shame as the Doctor and James had a great chemistry together. It feels a little odd though because this feels like a later Fourth Doctor, one that is travelling alone between The Deadly Assassin and The Face of Evil. That is another minor quibble though because this story, as strange as the premise might be, is very enjoyable. John Banks does a tremendous job on narration duties and does a reasonable job at imitating Tom Baker’s performance. While his take on the character might not be as good as Stephen Critchlow’s in the next story, you instantly know which Doctor he is supposed to be. And his narration skills are very enjoyable effortlessly bringing the story to life. Overall, Andy Lane has crafted a bittersweet story, one that shows the best and worst aspects of the Doctor. Telling us about the wonders of the universe and time-travel and then leave you behind to wonder who he was and why he singled you out. Ken Bentley has always been one of Big Finish’s strongest directors, and his track record continues here. This is another successful outing. Julian Richards gives us another Fourth Doctor story, this time paired with Mary Tamm’s Romana, where they find their lives inexplicably connected to the generations of the Warren family. Richard’s story is a good job and is enjoyable enough, though it isn’t as good as Only Connect. If anything is the problem it is that the story goes on for a little too long. Once we learn the connection between the Doctor, Romana and the Warren family, you only really need to hear a few meetings between them and the past generations of the family. However, it is a nice outing for the Fourth Doctor and Richards has a good handle on the main characters. They feel like the Fourth Doctor and Romana from the television series so that helps make the story more listenable than it might have been otherwise. I also liked the villains of the piece, the Quell, monsters who feel a little like the Weeping Angels. The cover is a little deceiving too, a lot of lamb skulls might imply that it would something more demonic than it actually is. But that isn’t too much of a problem because Simon Critchlow is hand to deliver some fantastic narration. Critchlow’s impersonation of the Fourth Doctor is practically pitch-perfect, like his impersonation of Jon Pertwee, there are moments when you would think that Tom Baker was delivering the lines. He was fantastic as the Fourth Doctor and one thinks they might have found a way to continue the Baker era on audio in many years time. 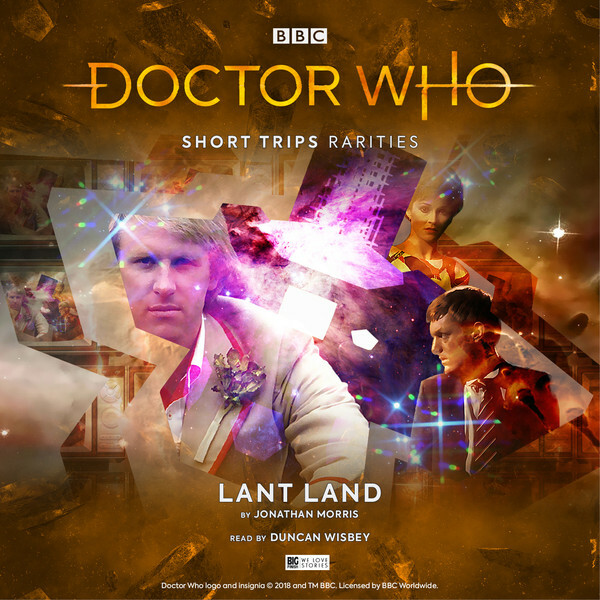 The series of Short Trips comes to an end with Lant Land, a story featuring the Fifth Doctor, Tegan and Turlough, who find themselves in a world that doesn’t seem real. It is a story with an interesting premise, even if it something that has been done to death in sci-fi land. Stuck in a reality where things don’t seem to make sense, what is real and what isn’t. Jonathan Morris does a fairly good job though with the story, trying to give us some new elements to this old trope but as with these other releases, he has a good handle on the characters with each one feeling like their television personas. Morris gives us some new character Yvonne and Derek who have some interesting story surrounding them. Duncan Wisby is on hand to deliver some good narration. He does a decent job, his performance of the Fifth Doctor and Turlough are passable but his Tegan is terrible. Like Critchlow didn’t have a good handle on Dodo, Tegan doesn’t sound very good. Morris has a bad habit of making Tegan whiny and moany which is annoying, particularly for me as she is my favourite companion. Unfortunately Lant Land isn’t the best way to finish this enjoyable set-off but it isn’t all bad as Nicholas Briggs is on hand to give us some nice direction and keep the story moving along. Overall, these new releases are thoroughly enjoyable, with A Home from Home and Only Connect being particularly strong stories from Nick Wallace and Andy Lane. While some of the narrators haven’t got a good handle on some of the characters, the writers certainly have and each story has something suitable unique about them. We’ve got a nice mixture of Doctor’s in this set of releases too which offers plenty of variety. There are a couple of stories, however, Only Connect and Lant Land that stop so abruptly that I had to check that the app hadn’t stopped working. But for five new enjoyable releases, that is nothing but a minor quibble. The Short Trips Rarieties is a great series, re-releasing those subscriber-only stories for those of us who don’t subscribe would miss otherwise. Let’s hope Big Finish carry on with them, it would be a shame for them to stop now. The Woman Who Fell to Earth tops the viewing figures for a series opener, the William Hartnell plaque is unveiled and there’s a new fan project book awaiting your submissions about Torchwood. Lovarzi release their new short version of the Fourth Doctors burgundy scarf, the upcoming TARDIS Type 40 Manual is on the way and Titan announce a new Thirteenth Doctor Kawaii 6.5″ figure along with the new TARDIS 6.5″. With the much-hyped Series 11 opener out the way, we’re into our first proper adventure. Does Jodie’s second story carry the momentum or is this one a bit flat, like, talking tissue paper flat? Thank you so much for joining us for 206. Next week it’s more of the same with the third ep – Rosa. Until then have a brilliant week and until next time – Allons-y! Mark Donaldson concludes his three part review of Ravenous 2 with Guy Adams’ Seizure, an atmospheric and creepy tale that introduces us to the Time Lords’ most primal fear. Answering a distress call from the villainous Eleven, the Doctor, Liv and Helen are soon exploring a dying TARDIS, haunted by a ghostly figure. That’s the least of their worries though, as the Time Lords’ greatest fear, the Ravenous are also on-board. Stories about the Time Lords are tricky things to get right, too much information and fans will say that you’re ruining the mystery or contradicting what has gone before (WHAT HAS HAPPENED TO THE MAGIC OF DOCTOR WHO?) whereas an underwhelming story will lead some to feel that there was hardly any point in revisiting the Time Lords after all. Seizure runs the risk of being the former, introducing the Ravenous as “the creature that all Time Lords fear” is a big ask, given that they’re an eternal, omnipresent, super-intelligent race of beings. What could possibly scare them? The eventual reveal of the boxed set’s titular villains is something altogether more monstrous and primal than you may expect, which this reviewer found slightly underwhelming. Whilst memorably played by George Asprey, there’s a distinct ‘monster of the week’ quality to the Ravenous, slobbering, shuffling monsters, with a penchant for taunting banter. One scene where Liv is chastised for bantering with the monster is an interesting role-reversal for Doctor and companion. They certainly have the potential to give us some new insight into the Doctor and his race, exemplified by a scene where the Doctor is so fearful that for a split-second he considers running away and leaving one of his companions behind. So, if the aim of the remaining two boxed sets is to explore what happens when Time Lords are scared then the Ravenous could indeed prove to be a fascinating creation. Fear is certainly at the forefront of Seizure, which is as much a Timelord ghost story as it is the introduction of a story arc. The sound design complements the script beautifully, providing the listener with a creepy soundscape of creaking doors, shifting stone walls and something scraping its way towards you out of the dark. It’s the strongest element of the play, a Gallifreyan take on (in an accidental piece of Netflix promotion) The Haunting of Hill House, featuring a TARDIS driven mad by the telepathic connection to its owner. It is, therefore, the perfect environment for fractured Time Lord villain, the Eleven. Mark Bonnar is reliably terrific as the Eleven, shifting effortlessly between each of the characters previous regenerations in his desperation to survive. That said, the black jacket he wears on the cover, the willingness to sacrifice anyone, and the fact that he’s not the lead villain does often call Missy to mind rather than the villainous Time Lord we met in Doom Coalition. For example, the opening scene where the Doctor discusses the morality of helping (or not helping) the Eleven is reminiscent of similar scenes between the Twelfth Doctor and Clara/Bill throughout the Capaldi era. This is a story that is very much driven by character, a creepy chamber piece predominantly featuring characters with whom we’ve spent a great deal of time over the years. On top of that, there is a small but strong guest cast in the form of Pippa Haywood as Jaxa, imbuing the role with just the right level of mystery to make her an engaging and tragic presence. Combined with the regulars, Haywood provides an invaluable contribution to an atmospheric chamber piece that allows each actor a chance to shine, a strong example of what these audio plays can do so well. Indeed, Ravenous 2 is a far stronger collection of stories than the previous set and has a much more assured sense of tonal and thematic cohesion which, if maintained, will serve future entries well. Whilst the monsters themselves may not quite live up to Big Finish’s ominous promotion, there is certainly promise in the form of an almighty cliffhanger which suggests that Seizures themes of fear, sacrifice and survival are a taster for the main course to the come when Ravenous 3 is released next year. Fun fact for you dear reader. Did you know that fear of the number 13 is a recognised phobia called Triskaidekaphobia dating back to 1911? Whilst I don’t have this fear it is ironic that this latest incarnation would be the one, creating the greatest division in recent times amongst fans, even more than the decision to have Peter Capaldi cast as an older Doctor. By deciding to create the first female incarnation of the role it has seemed, if you believe the hype, that it would either make or break Doctor Who fandom and the programme. Last Saturday we finally saw the fruits of Chris Chibnall’s year-long planning with the anticipated debut of Jodie Whittaker. Was it worth the wait? Well, what I am reminded of with debut episodes is just how difficult it is to write a successful one. The audience level of expectation is so high and each showrunner does want to do things slightly differently. The Woman who fell to Earth is a jumping on point much like “Rose” or “The Pilot” for the general viewer. The story itself isn’t that complicated. There is no series arc introduced just a straightforward alien encounter for a group of ordinary people in a northern town. We are introduced through the eyes of these normal people to the new Doctor. Chris Chibnall has wisely stuck to what he has learnt from writing Broadchurch, namely lots of interaction between his characters and gone down the RTD route with a crash course introduction to not only one but three new companions in the same episode and leaving the entrance of the doctor until later. This approach demands a lot of the audience to be able to connect and like these people within a short space of time. This is a risky ploy however as you do need to have to also ensure you an interesting enough premise to engage your audience. I’m not sure if this approach was entirely successful as the episode didn’t start by hitting the ground running. It was all a bit leisurely and domestic, a strange set-up as we saw Ryan trying to master a bike and failing. I did wonder initially was I watching Doctor Who or something else completely different. I can’t help here making comparisons here to the episode ‘Rose’ where we learnt in less than three minutes using the ‘show don’t tell’ approach about Rose’s work life, boyfriend and mum with hardly any dialogue. It is only when she goes down to the basement her first line of dialogue is heard actually looking for the missing Wilson and the story of the Autons begins. It’s a much more efficient way of showing us things and just getting on with the adventure. But Chris Chibnall has his roots in building up to events and developing the emotional drama. So, it’s a low-key start, concentrating on the ordinary human aspects of this world as we are introduced to new companion Ryan vlogging at his computer. We are drawn in as he talks about someone important to him, but is it who we think? Tosin Cole is very promising as Ryan, opening the episode and probably my favourite companion out of the three. He teases an ‘important woman’ and so the story starts with Ryan, his Nan Grace and step-grandfather Graham. Bradley Walsh as Graham is interesting as the relationship with Ryan hints at further tensions to be explored. There is a lot of time spent on the companions and I can see how Chibbers is trying to make us care for the characters of his world but I felt the episode did attempt to introduce too many secondary characters. Some were just not that interesting such as the man that took the transport pod, looking for answers about his sister. He was so sketchily written that I felt distanced from his story and it was only padding to fill 65 minutes. I did find some of the character dialogue clunky and expositional, obviously so, at times, such as why Ryan can’t master a bike revealed when his Nan mentions his dyspraxia, or Yas moaning to her superior wanting to be more challenged in her role. It was a shame because it felt shoe-horned in. The introduction of Yas was probably the weakest debut of the three companions as her links to the others are weaker. A nice enough girl but I found her a bit beige. Eve Myles also played a policewoman, Gwen Cooper in Torchwood and Eve felt far more real and convincing. Saying that it is only the first episode so there is plenty of time for development as Mandip had a minor role really compared to the others. The one character I did like immensely, who can return anytime, and who provided some welcome comic relief was Karl, played by Johnny Dixon. One of my favourite scenes is when the 13th Doctor is trying to persuade Karl to jump from his crane to her crane and he is willing himself to do it. The self-affirmations he used were very funny, and yes, I have said stuff like that to myself. He was totally relatable to me. I mean wouldn’t your instinct be to also just run off after the first sign of really weird stuff happening on a train? Self-preservation kicks in as he’s not as brave as the others and more worried about being late for his job working for his dad’s company. A lovely contrast to the gung-ho zest of Grace. 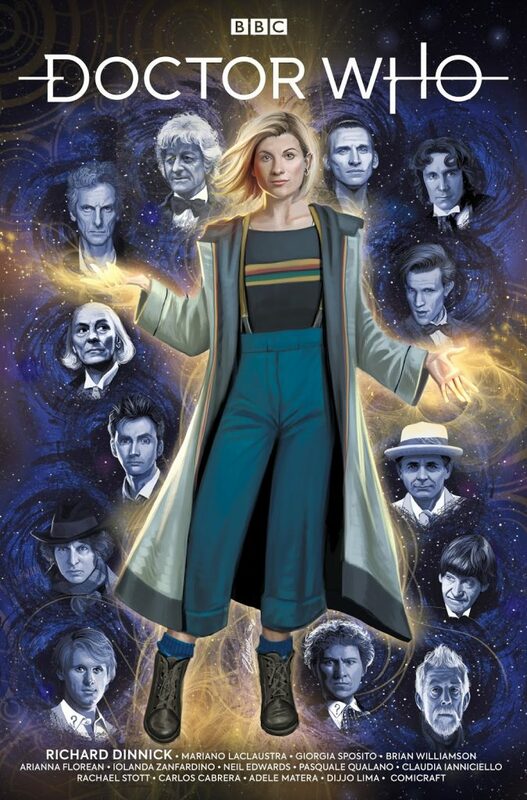 Ah, now Grace, a larger than life character, aiming to be brave like the Doctor and ironically, she is the woman who fell to Earth and dies whereas the Doctor is the woman who fell to Earth and lives. Chris Chibnall has been thinking this through. The death of Grace and the funeral, whilst bringing a sad moment into the story, didn’t really touch me though. I think if I’m honest if you are going to kill a character it has to feel earned and cared about. What I mean by that is; if her death had happened in episode 8 or 9 where we knew more about Ryan and Graham then the impact of her death would have felt greater to us as an audience because of their grief. Killing her when we hardly know her or the others becomes a short-term win opening up new doors for exploring Ryan and Graham but its ripple left me unaffected. Saying that I felt Graham’s speech at the funeral about how he should have been the one to go. Cancer is not a discriminator of age or gender. Do I sound too negative I don’t mean to be …? there are a lot of positives. I’ll be honest with you on the first watch I did originally think that I wouldn’t be watching this episode much again due to the rather unexpectedly depressing feeling it left me with. It wasn’t a light-toned romp as we have become used to It was a darker more gritty episode than I expected but the man has written Torchwood and Broad church so why was I surprised. But a second watch and I’ve decided this episode was actually ‘deliciously dark and dour’. No burping bins or wind passing aliens here! It is a fresh start, new minted and unfamiliar to Doctor Who fans. The direction by Jamie Childs is polished and I really enjoyed the contrast of the city and the peaks. As much as the dark colours on my TV were difficult to view at times (cheap tv!) it was great that they shot most of the story at night and the dark was used so effectively to tell the story. I loved the look of Sheffield at night and the incidental music by Segun Akinola has an eerie 1980’sci-fi film quality. The sparking gathering electrical coil on the train looked fantastic in the dark and when surveying the city later and the incidental music at this point was top notch as the orb blasted everyone with an energy bolt. I get a sense that Chris Chibnall, or is it Jamie Childs is a film and TV buff because I got vibes of the X Files, Terminator, Predator, even Bladerunner in the visuals through the episode. When we see “Tim Shaw” the dark does actually enable the Stenza to look impressive especially the moment he unveils his face adorned with the trophies of victim’s teeth. As a villain, the Stenza serve their purpose, a predator trolling the city. They aren’t out to conquer the world just use it for sport but it allows the Doctor’s protective champion side to be brought to the fore. So, onto the big question of Jodie Whittaker as the 13th Doctor. Does she succeed? The character does feel different because the Doctor is female. Is it strange to say that? I know it is addressed fairly quickly when Yas addresses her as madam and it isn’t spoken about again but there is that quintessentially female thing of trying clothes on in a shop in a changing room. How girly! and there seems to be a more sympathetic softer element to Jodie’s character. I was a little dismayed that we get hardly any explanation of how she survives crashing through the roof of the train without injuries but I suppose it is post-regeneration energy that keeps her alive. Surprisingly her ‘friends’ aren’t fazed by the prospect of meeting an alien just unbelieving that it would ever land there. Jodie doesn’t appear until about nine minutes into the story and I have wondered if that was a good decision. Steven Moffat when he was introducing Matt Smith put him at the centre of ‘The Eleventh Hour’ and Matt had such great comic timing that we really got to know a curious zany kind Doctor who very quickly stamped his “Doctory” authority in the first episode. Jodie doesn’t have that down yet. She bounced around like Tigger in this episode. She did the fast-talking shouty thing, like Tennant hopefully just her ‘fizzing’ in post-regeneration. I hope she calms down a little as the series progresses but I liked her bravery. The jump to save Karl was amazing! There is a childish joy in her reactions and her curiosity. I want to learn to make a sonic Swiss army knife with her. I really enjoyed her quieter scenes such as with Graham after the funeral. I don’t get a sense yet of who Jodie’s doctor will be but it looks promising. She is so different from the 12th Doctor who I loved and yet I see flashes of something similar to the past. The story also gave us a team “Doctor” as the 13th doctor surrounded herself with other people being without her Tardis. Having such a large number of people around Jodie for the moment does foster a group ensemble feel to the programme and I hope it’s not to hide her incarnation because she should be the leading lady. She’s Alan Sugar, not the apprentice! I get a sense that all of our team though are still finding their way. I am very curious to see how she is written by the other new writers this series. Meanwhile, little girls (and big girls) have a new hero to worship and adore. Viva Doctor Who! I am valued. I am special. A decent start 7/10. What did you think of the first episode? Post your thoughts on here or on Twitter. Let’s talk! Join me next week for the next episode review of “The Ghost Monument”. Mark Donaldson continues his three-part review of Ravenous 2, Big Finish’s latest 8th Doctor boxed set. This time focusing on the middle story, the two-part Christmassy tale Better Watch Out/Fairytale of Salzburg written by John Dorney. Among many things, the Eighth Doctor is the star of Doctor Who‘s best ever Christmas special, Robert Shearman’s wintery ghost story The Chimes of Midnight. Over a decade later, he does it all over again in a two-part dark Christmas fairy tale told to us through narration by both the Doctor and the mysterious Apostle (played so affectingly by Sian Phillips). 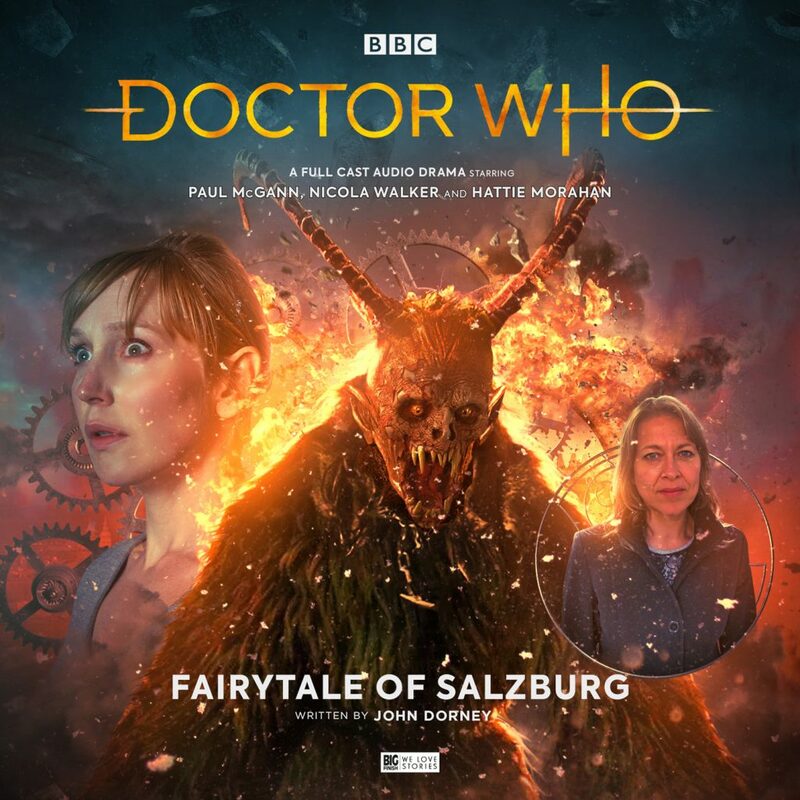 The Doctor, Liv and Helen visit Salzburg for the annual Krampusnacht celebrations where they come face to face with a fairy tale monster that’s very much real. Dorney was inspired to write this two-parter after a family holiday and his clear warmth and nostalgia for both the location and the season emanate from every level of the production. The sound design is a particular strength, transporting the listener from an uncharacteristically warm October afternoon to a bustling Christmas market, complete with the sound of carol singers, distant church bells and snow crunching underfoot. Whilst a few clues indicate that this is indeed modern Salzburg, there is a timelessness to the setting which reflects the unique charm of that period in December where real life puts itself on pause. It also evokes the feeling of stepping into one of those Christmas markets, a mass of old-fashioned chalets selling handmade goods in the heart of a bustling modern city. It doesn’t matter if the Doctor and his friends are paying with Euros or Kroener, Christmas is Christmas. On the subject of the Doctor and his friends, Better Watch Out‘s opening scenes feel like the first time this particular TARDIS team are having fun together. After all, the universe-shattering events of Dark Eyes and Doom Coalition never left much time for holidays or laughter. Paul McGann, in particular, appears to be relishing the chance to play a much lighter, less damaged version of his Doctor after such a gruelling few years following the loss of Lucie Miller. A speech about his love of snow and a bit of comedy business involving sausages show that sometimes, just sometimes, it’s still a lot of fun to travel with the 8th Doctor, even if an ominous pre-titles sequence informs us that the giggling about sausages will be short-lived, the wurst is yet to come. When it does come, via some expertly built tension flitting between each of our three leads as it slowly dawns on them what’s happening, the sound design shifts gears to present us with a terrifying hellscape designed to punish all of Salzburg’s bad boys and girls, leading to one of Doctor Who‘s bleakest cliffhangers. It’s difficult to imagine prime-time BBC1 signing off on something so dark outside of the EastEnders Christmas special. When the story picks up again in Fairytale of Salzburg, it’s up to Helen and Liv to save the Doctor and Salzburg from the terrifying Krampus which, in true Doctor Who style, involves a bit of a car chase, a bit of a runaround and some incredibly clever plotting that it would be churlish to spoil here. What Fairytale of Salzburg does, therefore, is allow Hattie Morahan as Helen Sinclair her defining companion moment. She’s been through the wringer a little bit in recent times, but here she gets to be the hero and proves herself to be the sort of resourceful and intelligent companion that the Doctor treasures so dearly. Which is not to say that Nicola Walker and Paul McGann are left high and dry, Walker gets an absolutely heartbreaking scene towards the end which allows her to display such a palpable degree of anger, heartbreak and love. McGann, whilst mostly absent, is terrific as a different type of Doctor, the omniscient narrator of people’s futures of whom we saw flashes in the original TV movie. Indeed, narration and storytelling are very much at the heart of this two-parter, and the power of a good yarn may be both the cause of and solution to such catastrophic Christmas events. What’s more, there’s an exhaustive checklist of references to other famous Christmas stories that never feels forced (and when it does, it’s very much the point) and adds further layers to the story. To say more would be to ruin what is a seasonal tour de force by John Dorney, which is at turns creepy, breathlessly exciting, heartbreakingly sad, humane, tender but above all, evocatively festive. Not only that, but it has an excellent monster, realised beautifully on the cover artwork by Tom Webster and in the audio itself by an uncredited actor who imbues the creature with a great deal of devilish charm and boo-hiss villainy. Everything you could want from a Doctor Who Christmas special, then. 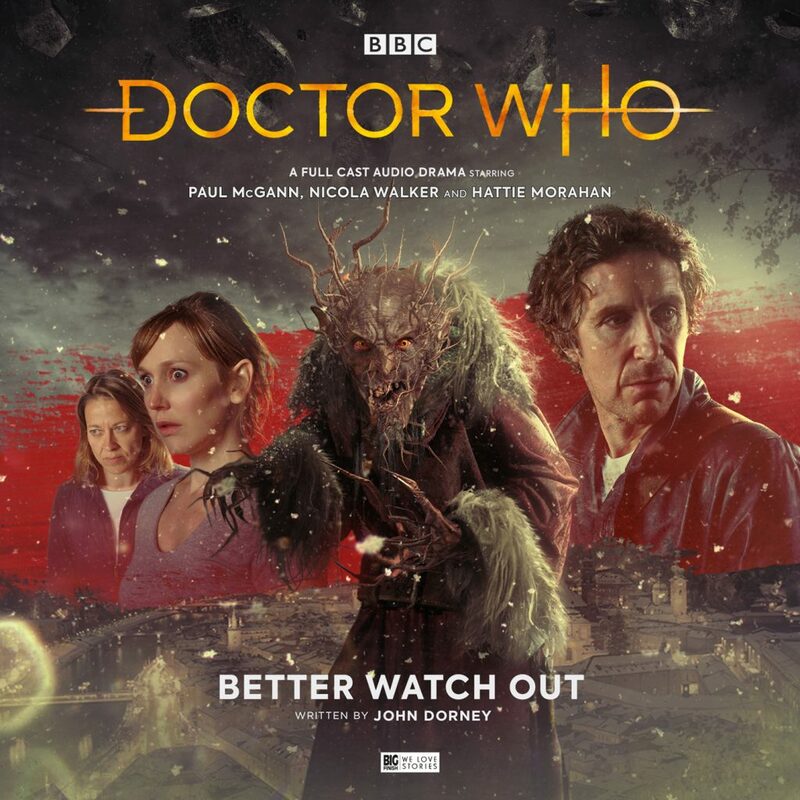 Cast: Paul McGann (The Doctor), Nicola Walker (Liv Chenka), Hattie Morahan (Helen Sinclair), Jamie Newall (Shafranek), Carla Mendonça (Waltraud Raither / Imp 1), Kate Rawson (Inge / Imp 2), Ewan Goddard (Christophe / Krampus Runner), Robert Whitelock (Bruno / Vagabond / Priest), Siân Phillips (Pilgrim), Raad Rawi(Bishop) Kate Duchêne (Antonia Werner), Susan Hingley (Maria Werner). Other parts played by members of the cast. 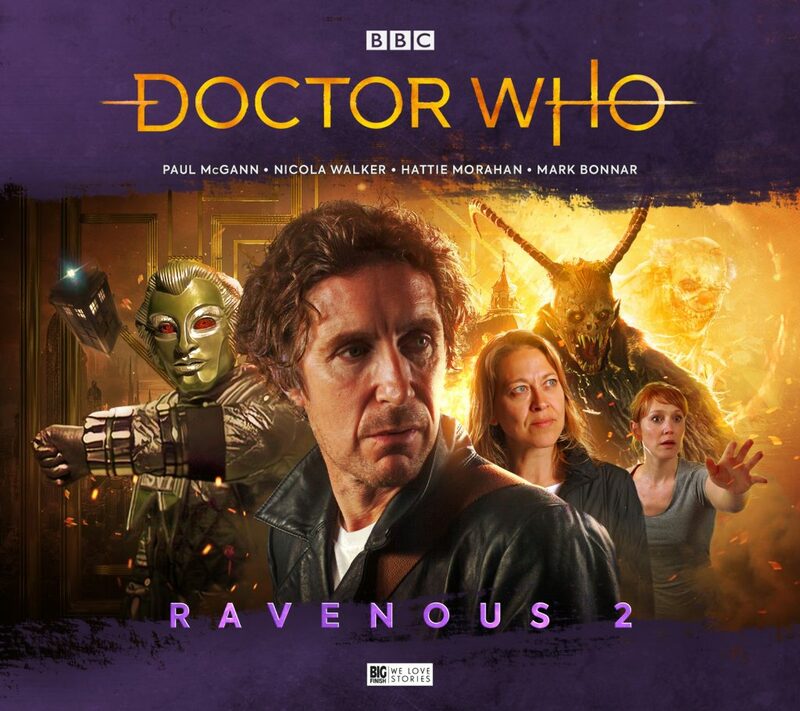 It’s a bold move for Big Finish to release a new Paul McGann boxed set in the days immediately following the return of the main show to our screens, but in the first of a three-part review, Mark Donaldson finds much to enjoy in Ravenous 2, a set of stories that prove the old Doctors are still worth revisiting. The previous Ravenous boxed set achieved the rather impressive feat of turning 1980s villain, the Kandyman into something much more sinister and grounded than the multi-coloured, copyright skirting joke of The Happiness Patrol. Aside from that, compared to epic scope of Dark Eyes and Doom Coalition it was a fairly lacklustre and retrograde start to Big Finish’s latest Eighth Doctor arc, providing some fairly disposable “story of the week” adventures. Ravenous 2 sticks to that same structure, providing two standalone tales before the arc kicks into high gear in the final entry in the set. 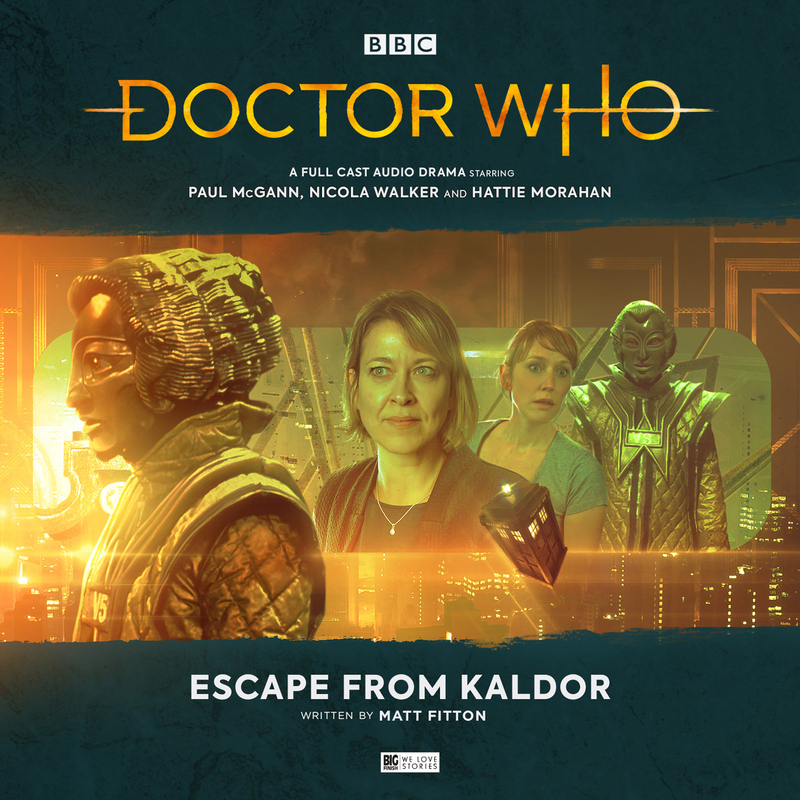 First up is Matt Fitton’s Escape from Kaldor which finds the Doctor returning Liv to her homeworld of Kaldor City, where they and Helen come face to face with a new generation of Voc robots as well as Liv’s complex personal life. This is the second Robots of Death inspired adventure released by Big Finish this year after January’s Sons of Kaldor so there’s a wearying sense of repetition here. Having the Doctor respond to the OverTech’s assertion that the robots couldn’t possibly commit murder with “it was the same the last time and the time before that” seems more like an admission of guilt on the writer’s part than anything else. A later scene finds the Doctor and Helen discussing the appeal of the Voc robot design, which is iconic, but the fact remains that their general motivation is always in the hands of someone else messing with their programming. It was the same reason why the Ood had such diminishing returns in both Planet of the Ood and The Doctor’s Wife. Thankfully, the robots are predominantly there to provide a bit of Doctor Who style death and destruction to a story that is much more interested in covering themes of the distribution of wealth, inequality and the collateral damage of corporate cover-ups. There’s a real-world relevance here, and Fitton deftly builds on the world originally conceived by Chris Boucher. For example, the Doctor’s first scene, coming up against some anti-corporation protesters is perhaps the closest we’ll get to Doctor Who covering the Occupy movement. The real strength of the story and this era of Eighth Doctor adventures as a whole is Nicola Walker as Liv Chenka, who gets her own “companion returns home” story in the vein of Survival or Aliens of London. Refreshingly, Liv is back home unwillingly thanks to a well-meaning but misguided decision by the Doctor. Without any family to return to, she no longer feels like she belongs among the selfish and materialistic people of Kaldor City. Liv’s tension is the emotional core of Escape from Kaldor and provides a fresh spin on the homecoming model perfected by Russell T. Davies. Whilst a former colleague from her MedTech days receives short shrift, her conflict with a figure from her past is emotionally nuanced, never feeling overblown or melodramatic. Walker and Claire Rushbrook are magnificent at capturing the deep, complicated love that resides underneath each character’s anger and disappointment. It is therefore frustrating that this aspect of the story takes so long to pick up speed, ultimately receiving an abrupt, cop-out ending. Despite that, however, Escape from Kaldor is a story that has a lot going for it, corporate satire, some blackly comic (albeit a little noisy and hard to follow) death scenes during the robot rampage, and an affecting family relationship. It shares a major flaw with many of Doctor Who‘s similarly flawed stories of the past 55 years, in that it has so many intriguing ideas but can never really decide which element it’s most interested in, which often results in the most compelling characters getting short-changed. A quick update on the Hartnell Heritage Plaque and the Series 11 opener overnight viewing figures. Volume 3 of the Tenth Doctor Adventures is coming in May 2019 featuring Wilf and there’s an exclusive (and very expensive!) limited edition 13th Doctor Barbie if you can find one. It’s finally here! It’s great to watch our new Doctor doing her thing as we kick off our Series 11 reviews. Was it all worth the wait and hype or are we in the familiar territory of first episode mania? Thank you so much for joining us for 205. Next week we’re moving forward into Series 11 with the second ep – The Ghost Monument. Until then have a brilliant week and until next time – Allons-y! First of all, the cut of the jacket isn’t right. The Talons jacket is much more like the Fourth Doctor’s own purple frock coat (as seen on last year’s B&M Fourth Doctor), but much shorter. It should also be open rather than closed. The colour is very nice, but it is missing the pattern seen on the screen used jacket. The second point of contention is the waistcoat. This is the first new piece of sculpting to be seen in a B&M set, but it is extremely basic. Only one button is sculpted on when really, a second should be visible. The colour is also wrong – it’s grey as opposed to purple with a floral pattern. The sculpt also features a tie, but this is hard to make out under the very sloppy paint application. It’s painted red which is good but it should be a tad darker. It also doesn’t sit flush with the collar, which is another problem. The Third Doctor figure sports a regular shirt collar, whereas it should be a wing-tipped collar. The cape is also inaccurate, but this is the aspect of the figure I’m most happy with. The issues here are the lack of lining and the fact that the cape seen in the episode had a single wing spanning the back of it. The paint application has in a way, helped to try and convey this. The application of the lines on the cape is a bit sloppy in places, but I’m just glad they went to the effort of applying it. I did once make my own version of this cape for a custom figure and I think there may be a few lines missing, but given how dark Talons is throughout you can hardly tell. All the problems stated above have come as the result of re-using sculpts. The figure is inaccurate, and it bugs me, but I can understand why. What I cannot understand, however, is the decision to use the Third Doctor legs with the boots and paint them to look like shoes, rather than using the Third Doctor legs which actually have shoes. It looks absolutely ridiculous. 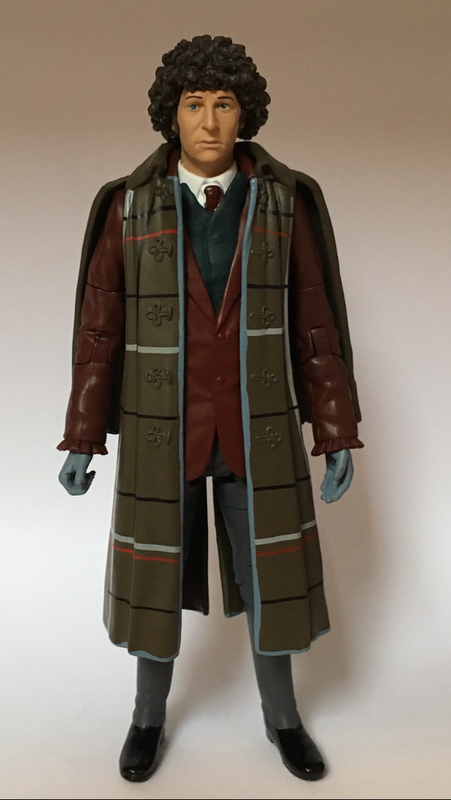 I could understand if they perhaps needed to use this mould for some sort of cost reason, but the legs with the shoes have been used on the Third Doctor in this very same wave. Why couldn’t this figure have them instead? The Third Doctor could’ve then had the boots and, complete with a darker red jacket and painted cravat, we could’ve had a rather nice Mutants variant. The final thing to talk about on this figure is the head. This isn’t as well painted as some older releases, but the skin tone is great. Obviously, the major point of contention here would be the lack of his hat. But there are moments in Talons when he is seen without it so it doesn’t bother me. Interestingly, they’ve been able to put a peg inside the Third Doctor torso piece. This suggests that they may be able to attempt other interesting kit-bashes in the future. Articulation is the same as on previous Third Doctor figures. The Doctor does not come with any accessories. Speaking of interesting kit-bashes, another surprise release was the Brigadier from Season 7. This is the first figure of him to not use the modular body seen on the three previous versions. The body is, in fact, that of Captain Jack Harkness from Series One. At first glance, this is an excellent match. It’s really great that they’ve managed to put this out. I had no idea the Brigadier head could be used on it. At a closer glance, however, there are several details that aren’t quite right. The figure should have a closed shirt with a tie rather than an open one with a scarf. There are no lapels present either. The RAF badge has just been painted over and there are no UNIT badges on the left arm. The belt has not been painted, nor is there a holster. There are however occasions when the Brigadier is seen sans belt, so this is not a major issue. In fact, none of these really are. You can tell exactly what the figure is supposed to be from one look, which is more than can be said for the Talons Tom. A big gripe I do have with this figure lies in the paint application. The colour is much too light for my liking and should be a bit browner. The head, however, is a much bigger issue. The eyes look extremely strange. The white dot in the centre is barely visible, making his pupils look completely black. The paint applied to the eyebrows and moustache is far less subtle than the previous figures, making his face look very cartoony. The badge on the beret is also missing the detail of the UNIT text seen on the Claws of Axos figure. Articulation is the same as on the original Captain Jack figure. The Brigadier does not come with any accessories. The Auton is by far the least interesting figure in this set. It’s a very basic repaint of the Spearhead from Space figure and again, is inaccurate. The figure is meant to be from Terror of the Autons, but the head is very different to what we see on screen. Nevertheless, it’s been finished very nicely. The head and hands have actually been cast in the appropriate colour rather than being painted, giving them a very nice plastic look. The costume is close enough and the colour is very good, but none of the buttons or the belt buckle has been painted silver which is slightly disappointing. Ideally, the figure would also be wearing boots instead of shoes, but that would never have been a possibility in one of these sets. The gun hand is included but the closed hand is not. Paint application here is much more basic than on the original figure. 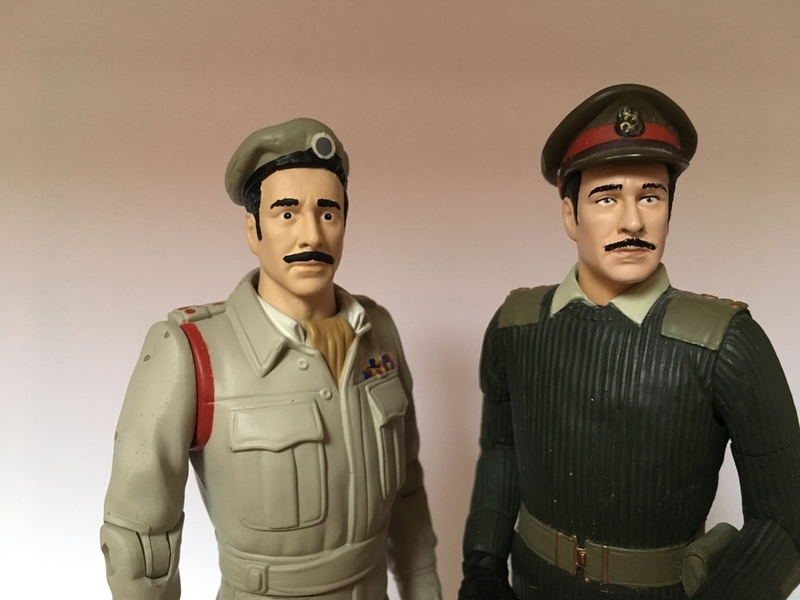 It is also worth mentioning that the Brigadier and Auton figures share the same Captain Jack body as a base, which makes the Auton figure an odd inclusion as it means we are getting two extremely similar figures within one set. 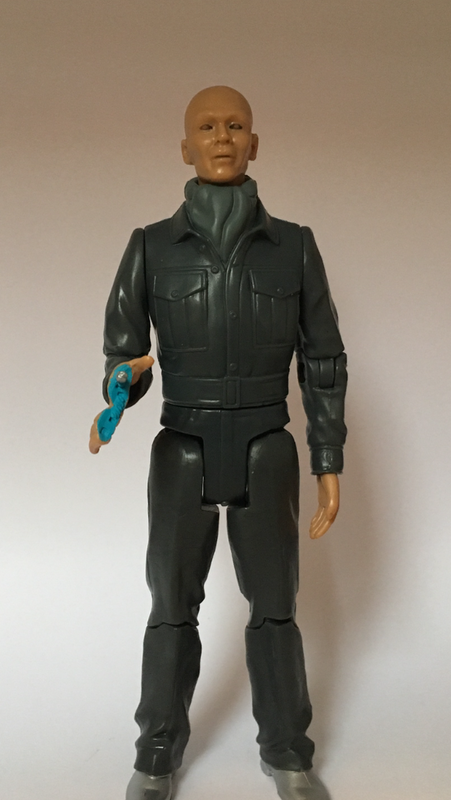 Articulation is the same as on the original Auton figure. Auton does not come with any accessories. Now for a word on quality control. This set is rather weak in this respect. When attempting to plug the Doctor’s head back on after removing it, I found it extremely difficult to do so. This head was not, after all, tooled for the Third Doctor body. As a result, quite a bit of paint has flaked off. This thankfully isn’t visible but doing this repeatedly may cause it to become so. I saw other figures in the shop where the hair had been glued on at odd angles, and there didn’t seem to be a cape with entirely neat lines. The waistcoat piece on my figure had also not been put in place properly. 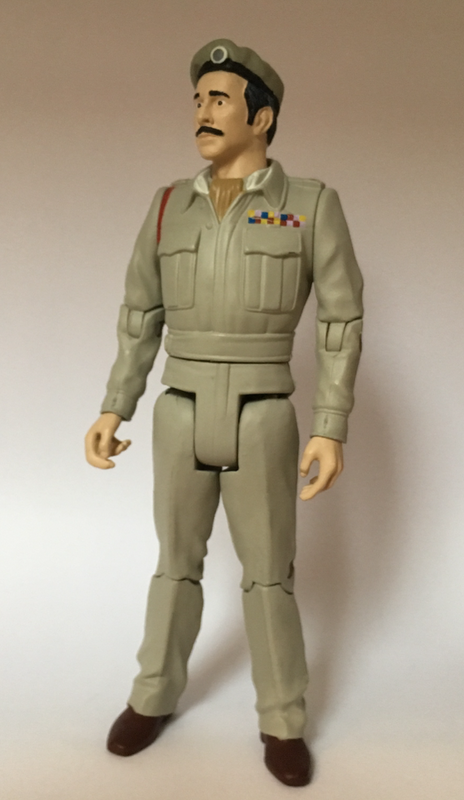 The Brigadier figure does come across as a bit low quality. The legs on my figure are bent outwards; legs seem to be the source of problems throughout all of these sets. There are several places on the figure, particularly the arms, where paint has flaked off. This looks absolutely awful. I know there have been other issues with this particular figure which just reinforces my opinion of it being of a poor quality. The Auton figure meanwhile, is fine. The shinier plastic finish on the clothing doe make it look slightly cheap in comparison to the old figure, but this is but a tiny nit-pick. Given the fact that this set is of a lesser quality, I see it more as a source of custom parts more than anything else. I’ve nabbed the cape off of the Talons figure to complete my own, more accurate version. With the Third Doctor body, I’m putting together a Mutants Third Doctor. I also have plans to make the Brigadier figure much more accurate. The Auton, however, will stay as is (although I have given him the normal hand from the original release). 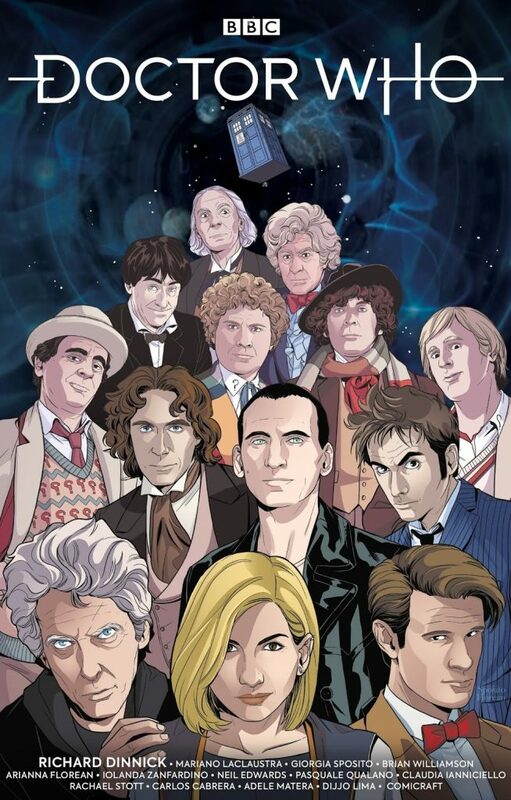 On-screen, the multi-Doctor story tends to appear every ten years to celebrate anniversaries. In the panels of the comic book page, however, the multi-Doctor story is becoming something of an annual event. Since 2013’s anniversary tale Prisoners of Time, we’ve had Four Doctors in 2015, Supremacy of the Cybermen in 2016 and, published last year, The Lost Dimension. It’s a solid fixture of Titan’s summer “event” release strategy, one huge story told across their existing Tenth, Eleventh and Twelfth ranges, often with occasional input from other Doctors. It’s nothing new for the comics world, Marvel and DC have been doing it for years and it’s a model that has, to varying degrees of success, transferred to the cinema over the past decade. Given that we’re a few days from the broadcast of Jodie Whittaker’s full debut in The Woman Who Fell to Earth, Titan has adopted a different approach this year. Over the past few weeks, they’ve published self-contained standalone 10th, 11th and 12th Doctor adventures under the banner of The Road to the Thirteenth Doctor each including a coda involving, presumably, the 13th Doctor’s hand reaching into her previous selves’ adventures. We’re yet to find out what this means (another multi-Doctor event to see Titan through the winter perhaps?) but have been assured the story will continue in The Thirteenth Doctor #1, due for publication on October 17th and headed by an all-female creative team. Before that, however, Titan has published The Thirteenth Doctor #0, a special edition prequel that both celebrates the past whilst looking ahead to the glorious future. Structured around the idea of life passing before your eyes at the moment of death, Richard Dinnick’s script is set during the Twelfth Doctor’s regeneration into the Thirteenth, as an unidentified narrator (the Doctor himself, not quite done dispensing advice to his successor or the TARDIS are this reviewer’s guesses) guides them through memories of past adventures for each of the thirteen previous incarnations. These snippets, often focusing on either the start or climactic resolution of an unseen adventure aren’t always narratively satisfying to the point that if you miss any of the guiding narration, you may feel like some pages have fallen out in transit. There’s a breakneck pace to much of this, which is presumably due to the need to fit as much, for want of a better term, Doctor Whoness into proceedings. So we get a celebrity historical, alien planets, a visit to Gallifrey, the Time War, Daleks, River Song, The Master, spaceships, alien invasions of Earth which can often leave the reader feeling over-indulged. That being said, the strongest segments capture an essence of the featured Doctor and era as well as the overall appeal of this 55-year-old television programme. Dinnick has the benefit of a huge team of artists illustrating his story, which reflects the different creative teams involved across the five decades of the show’s production. It’s often the case in reviews where there is some criticism aimed at an artist’s inability to 100% capture an actor or character’s likeness, perhaps a hangover from the good old bad old days of World Distributor’s creative approach to licensing contracts. The artwork is strongest when it’s more concerned with capturing a certain mood. 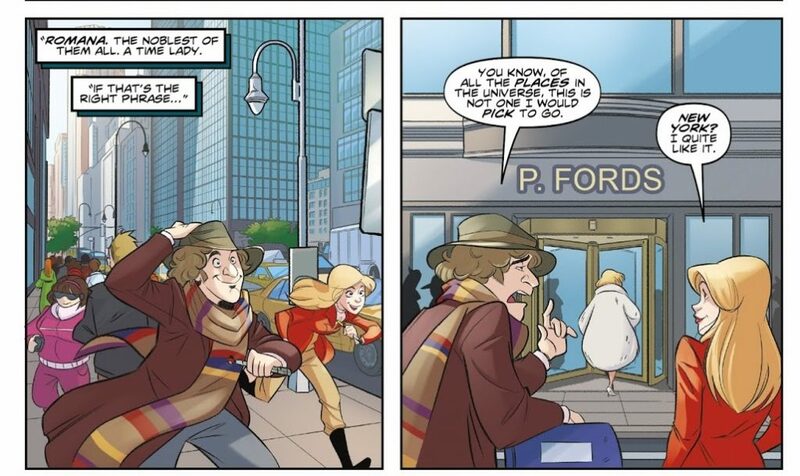 For example, Arianna Florean’s Disney style illustration of a Fourth Doctor and Romana adventure captures the wit and whimsy of that breezy Season 17 period as City of Death is essentially relocated to the world of department stores and New York socialites. Titan is pitching this as the perfect beginner’s guide, which is a noble enough intention but with a dazzling array of artwork, whistle-stop tour of the Doctor’s previous incarnations and a focus on the 8th, 10th and 11th’s comic book companions it is truer to say that The Thirteenth Doctor #0 is a primer for Titan’s back catalogue and upcoming Thirteenth Doctor range. It is also an entertaining, diverting way to pass these last, slow days until the Thirteenth Doctor comes crashing into our lives on October 7th.